The snow is piling high in the Class V Wild and Scenic California Salmon River watershed and we are getting very excited for the best ‘Cal Salmon’ season in years! It is one of the most spectacular class V adventures in the country. 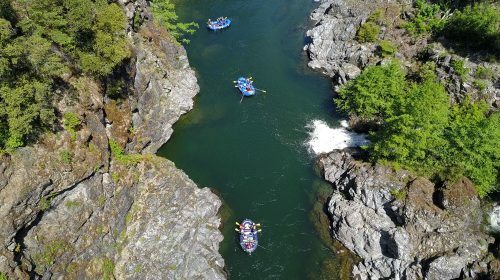 The Salmon combine a beautiful granite gorge, emerald-green water, comfortable pop-up glamping, and unequaled class IV-V pool-drop whitewater. This is truly a world-class, high-adventure whitewater run, our favorite class V river in the U.S., and one of the biggest reasons Momentum is located where we are. Located in one of the most remote parts of California – the “Trinity Alps” of far Northwest California – it is “pilgrimage” that many of our guests take year after year. Many call it a “mini Futaleufu” because of the way it looks and the style of whitewater. The trip combines all the whitewater with really comfortable camping and over the years our pop-up base camp has gotten even more comfortable. There are walk-in tents with cots set among the trees, a tented eating and hang out area, and there is always a big camp fire burning. The late afternoon can be spent hiking, biking, playing games in the sun, having a drink around the campfire, or just hanging out in a hammock. And, with all the snow, this will be our best season in years. 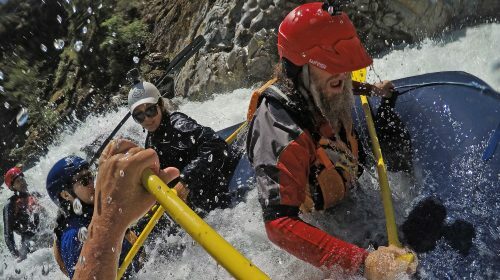 So join us for a weekend in May for some of the most classic and incredible advanced whitewater in the world, comfortable nights under huge coastal mountains, time with old and new friends around the campfire, and a chance to get away from wifi, cell phone chatter, and hectic daily schedules.